A new cocktail bar has opened for business in the neighborhood. Called The Pink Squirrel, the fresh addition is located at 2414 N. Milwaukee Ave. (between Richmond St. & Fullerton Ave.) in Logan Square. This newcomer bills itself as a Midwest cocktail lounge that pairs "supper club classics with throwback entertainment." The lounge features 1950's-style decor, along with a duckpin bowling and "grandpa's favorite cocktails," like the Grasshopper (Creme de menthe, creme de cacao) or the famed Pink Squirrel (vanilla ice cream, creme de cacao, and ruby red Creme de Noyaux)-- said to be invented in Milwaukee, Wisconsin, in the 1950s. The Pink Squirrel has built a following on Yelp, with users giving it a 4.5-star rating out of 11 reviews thus far. Goof D., who was the first Yelper to review the new spot on December 9th, said: "This is not just another new bar. 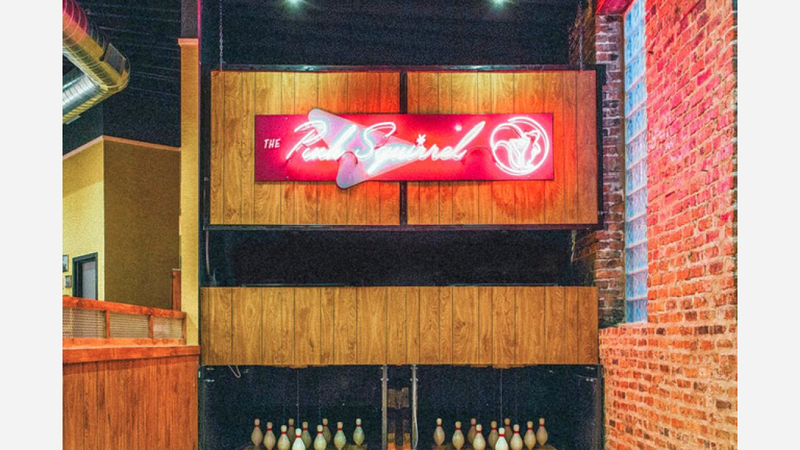 Pink squirrel has the setup with its 50s 60s vibes and atmosphere that other bars try hard to pull off. Delicious cocktails, great bartenders, and friendly staff." Interested? Stop by to welcome the new business to the neighborhood. The Pink Squirrel is open Saturday from 5pm-3am, and Sunday-Friday from 5pm-2am.